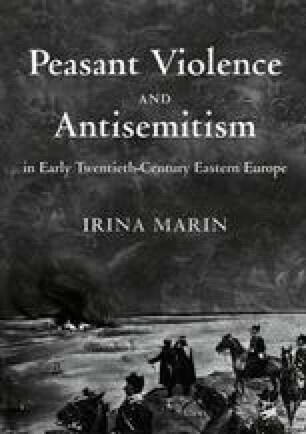 This chapter proposes a study of the administrative and policing system of Romania at the time of the uprising. This, as the author argues, is vital to understanding why the uprising reached such a scale and spread in such a short time. By comparing this to the administrative systems across the border in Austria-Hungary and Tsarist Bessarabia, the chapter inaugurates the second part of the book, which tracks the reverberations of the uprising across the triple frontier at the level of administration, public opinion and diplomacy.